XTIVIA, Inc., a leader in Digital Experience Solutions, has been honored with the Liferay North American Partner of the Year Award for Net New Revenue. The Partner Award is bestowed on the channel partners who best address Liferay users’ most pressing business challenges and are designed to recognize superior customer service and the development of new growth opportunities. 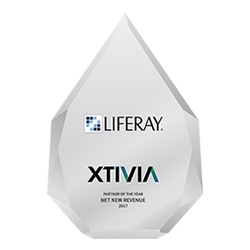 Chicago, IL, July 11, 2018 --(PR.com)-- XTIVIA, Inc., a leader in Digital Experience Solutions, today announced that it has been honored with the Liferay North American Partner of the Year Award for Net New Revenue during Liferay’s annual North American Partner Conference in Chicago, Illinois. Bestowed on the channel partners who best address Liferay users’ most pressing business challenges, the Liferay North American Partner of the Year Awards are designed to recognize superior customer service and the development of new growth opportunities. Areas of consideration include total revenue growth, new revenue growth and the number of net new customers. “We are very excited to win the Liferay North America Partner of the Year, Net New Revenue Award. This is the fourth year we have received recognition as a Partner of the Year. It validates our commitment to our amazing partnership with the people at Liferay, our talented employees and, most importantly the superior quality results we provide to our valued customers who put their trust in us every day. We are enthusiastic about Liferay’s vision and future direction, which includes the expansion of the Liferay Digital Experience Platform with the new offerings. We believe these additions to the product suite will enable Liferay to provide enhanced value to both our existing and future customers,” said Nir Gryn, Senior Vice President of Sales at XTIVIA. “We are elated to win the Liferay North American Partner of the Year, Net New Revenue Award. We continue to invest heavily in our Liferay partnership through our innovations and accelerators on top of the Liferay Digital Experience Platform. I am proud to work with our amazing XTIVIA team, who continue to grow their skills and implement industry best practices. This award, along with exciting additions to Liferay’s product family, further cement our commitment to the Liferay ecosystem,” said Vivek Agarwal, CTO of XTIVIA. To find out more about XTIVIA’s Liferay services, please visit: https://www.xtivia.com/services/digital-experience-platforms/liferay-dxp/.